As Minister of Stupidity, it recently was brought to my attention there is no real summer holiday between the stellar events of July 20 (Apollo Moon Landing, 1969) and Labor Day. Sure, if you are a heathen or a teacher, there’s always that first day of school thing, but, seriously, not exactly a holiday. There is also the first day of football practice. But again, although somewhat exciting to be back at football, two-a-day really are not anyone’s real idea of a holiday. So where are we left now? The Holiday Desert. The new holiday is Magic 8 Ball Day. I propose a date of August 8th to hold this new esteemed holiday. On Magic 8 Ball Day, one should only respond to questions with standard answers from the most famous toy-with-a-dark-purpose ever invented. The toy which can read the stars and give the most relevant answer to life’s biggest questions. 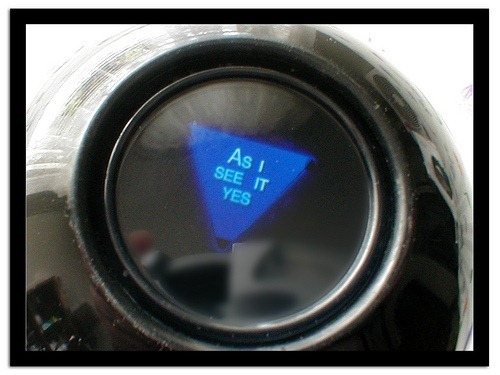 Are you starting to see the beauty of Magic 8 Ball Day? It will be the perfect day to find answers to your burning questions. Happy Magic 8 Ball Day!